Here's Pokemon Go Experience Guide. Pokémon GO has been updated to version 0.33.0 for Android and 1.3.0 soon for iOS devices. Below are some release notes and comments from our development team. -Added a dialog to remind Trainers that they should not play while traveling above a certain speed. Trainers must confirm they are not driving in order to continue playing. -Made improvements to the accuracy of a curveball throw. 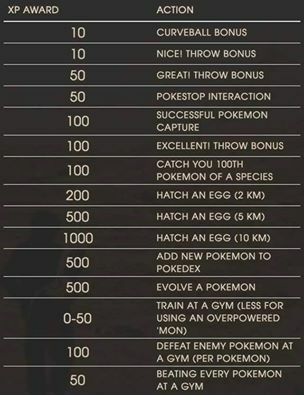 -Fixed a bug that prevented ”Nice,” ”Great,” and “Excellent” Poké Ball throws from awarding the appropriate XP bonuses. -Fixed achievements showing incorrect Medal icons. -Enabled the ability for Trainers to change their nickname one time. Please choose your new nickname wisely. -Resolved issues with the battery saver mode on iOS and re-enabled the feature. -Added visuals of Team Leaders Candela, Blanche, and Spark. -We’re currently testing a variation of the “Nearby Pokémon” feature with a subset of users. During this period you may see some variation in the nearby Pokémon UI.